The turn-of-the-century charm in Tom and Irene Curry’s farmhouse-style home in Evanston, Illinois, was hard to miss. Original tile enlivened the fireplace, and neighborhood life played out through the front bay window. But after five years in the 1,350-square-foot home, the winning details couldn’t overshadow the constricted nature of the house, where they were raising their children Zoe and Jake. The illogical kitchen, narrow staircase, and conservative design impeded the family’s daily rhythm, while grandfathered energy-inefficient systems created unnecessary waste. When the couple gave Chicago architect John Issa a wish list for their $225,000 renovation project, they couldn’t envision how the puzzle pieces would fit into the existing structure. The challenge, according to Tom, was to “maximize the space” by reconfiguring the first-floor kitchen, while also adding a new master suite and two full baths. Issa began by thinking outside the stereotypical modern box. 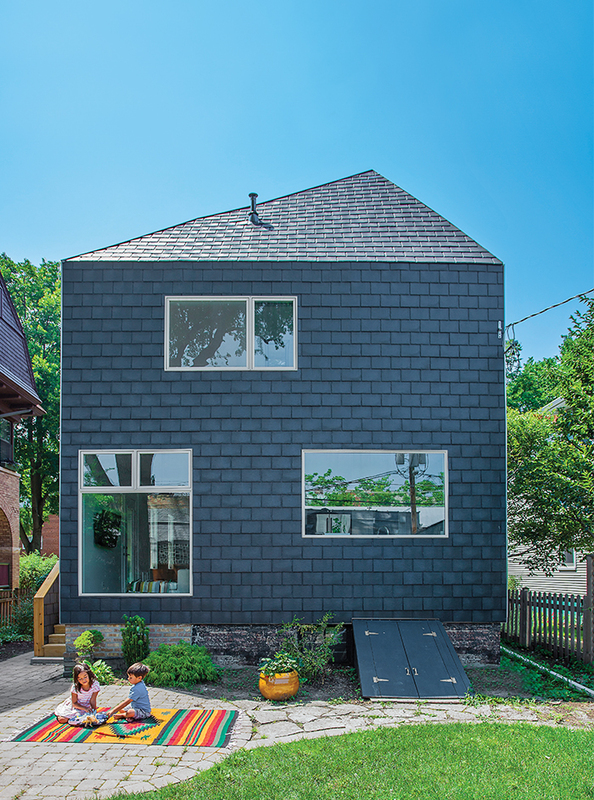 He clad a new rear volume in striking slate-colored tiles from Inspire Roofing Products, which makes a lightweight, synthetic material flexible enough to wrap the rear facade and up onto the peaked roof. A seamless vertical span, lifted by new steel supports, stretches everything out, freeing up the blocky, balloon-framed interior. Issa’s philosophy—creativity bounded by refined pragmatism—is at work throughout the renovation, which added 650 square feet and increased energy efficiency. Spray-foam insulation and triple-glazed Pella windows ensure a tight envelope for the extension, and with an R-Value of 48, the home now costs less to heat than it did before the renovation. Mirroring the geometry of the roof extension, the new master suite incorporates a sculpted 18-foot cathedral ceiling and skylight. The light-filled channel, wide enough to create a stack effect that circulates air and cools the home, can also be closed off, so that Irene, an ER doctor on a varied schedule, can sleep during the daytime.